I get a lot more satisfaction out of fixing things than I do replacing them. Part of it is the challenge, part of it is the learning experience, and part of it is the savings. But I think the biggest part of it may be genetically programmed into my DNA. I do realize that sometimes it’s cheaper to replace something than it is the repair it. The other day I was looking over a broken electric can opener that we had replaced for the princely sum of $15 and realized that it was not worth repairing. I didn’t know what I’d do with an extra used electric can opener if I did repair it when they are available new for as little as $6 at Target. I got an inquiry last week from my cousin in Pennsylvania about whether a power supply for a Compaq PC manufactured in 2002 should cost $185. I am usually able to pick up PC power supplies for as little $15 to $25, and so this price seemed way out of line. Upon further investigation I found that back in 2002 Compaq was using a non-standard connector and case size in their desktop power supplies. This makes the power supply rare and therefore very expensive. After looking over the pinout of the motherboard connector for the Presario 5000 model, it appeared that the majority of the pins were consistent with the ATX standard, but there were enough changes that it would take some fiddling to adapt a standard power supply to work like the Compaq model. The failure mode didn’t seem consistent with a normal power supply failure though. Usually when a PC’s power supply fails, the computer will show no signs of life. In this case, the computer would power on, but in a short time would shut itself down. This made me suspect that perhaps there was a bad electrolytic cap on the motherboard that would short and cause an over-current condition after things warmed up. If that were true, even a new power supply wouldn’t fix the problem. My uncle is quite handy designing and fixing all things electrical and mechanical and offered to help. Despite having very little experience with computers, in a relatively short time, he and another relative were able to determine that the power supply’s fan had stopped spinning. That would explain why it was powering on but shutting down after a while. He went to Radio Shack and found a similar fan but it would not fit inside the power supply’s case. No problem, he mounted it outside the computer’s case over the power supply vent. It still fulfills the need of moving air through the power supply to prevent it from overheating. The fix worked and the PC has been successfully resuscitated. It may be his nearly 70 years of ham radio and tinkering experience that came to the rescue because once you understand how things work, you can fix them even if you’ve never done a repair exactly like it before. And then, of course, there’s that DNA thing too. 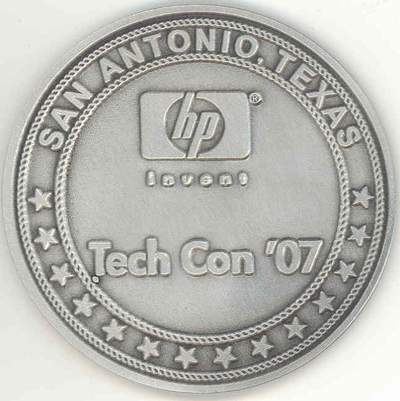 Last week I went to a very prestigious HP-sponsored technology conference called Techcon. You have to earn your way there by writing a paper that is judged against more than a thousand other papers written by the best technologists in the company. There are only about 120 papers accepted and so we were very honored to get an invitation to present our paper at the conference. The topic of our paper was related to the new HP MediaSmart Servers recently announced at the CES that are expected to ship this fall. There was a lot of interest in our product because it was something that just about everyone needs at home so it was a pleasure to get to talk about it with other technology enthusiasts. There were a lot of other interesting papers presented at the conference but it was confidential so I can’t discuss it here. In addition to the authors of the papers, there are a number of other people who attended the conference including HP’s CEO and CTO, HP Fellows, and some who had volunteered to review the papers. One of the chief benefits of the conference is the chance to meet and network with HP engineers from around the company and to talk with leading experts in a number of important fields. It seemed that every time I turned around, I met someone with an impressive background. Even on the overbooked plane ride to the conference, I had a middle seat, but as a result that I got to meet and chat with experts in both image processing and mobile devices who were sitting on either side of me. On the way back, we were delayed for several hours in the San Antonio airport and as a result of that “misfortune” we had dinner with five HP technologists who we would not have had the chance to meet otherwise. I like conferences with an “immersive” feel where you get to experience something from early in the morning until late in the evening, and Techncon’s schedule is jam packed with activities. I find Airventure to be that way as well as Entconnect, two other conferences which I regularly attend. Only part of the feeling is a result of the activities and presentations. Most of it comes from interacting with like-minded individuals who are enthusiastic about the subject of the conference. I got an HP rx5900 Travel Companion recently as an award for having a paper accepted at a conference. It’s by far the coolest toy I’ve gotten in a very long time, and that’s saying a lot because I’m a bit of a gadget geek. The HP rx5900 Travel Companion was featured on the OCC-HP Bike that I wrote about earlier. I have desperately wanted one of these since they came out because I need a GPS/moving map for all of my vehicles, my motorcycle, car, and airplane and it looks like this is going to work perfectly. It comes with the GPS and TomTom Navigator software built in and the amount of detail it provides for the roads is incredible. The mounting accessories and charging devices are very cleverly designed. All it needs for charging is a USB cable, so anywhere you have an USB socket, you can charge it up. Even the cigarette lighter and wall plug have a USB socket in them, and this is absolutely brilliant. I had it up and running in no time, and found that not only is it a great navigation device, but it has a full PocketPC capabilities including the ability to sync with my PC so I can access my contact and task list as well as my schedule while I’m away from the PC. I can add changes and then re-sync with the PC when I return. 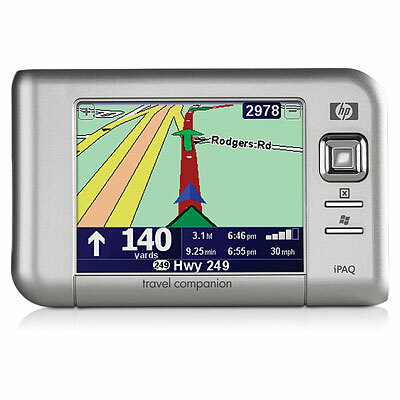 I was hoping that it would run aviation navigation software called Anywhere Map and so I visited the website and found that not only would it run the software, but the HP Travel Companion is a recommended system. I had tried using Anywhere Map previously, but found that a Blue Tooth GPS which was separate from the PDA was problematic in the aiplane because the PDA would periodically lose track of the GPS unit. It also meant more devices to charge and keep track of, so the built-in GPS is a welcome addition to this device. Best of all, when I get out of the plane and travel by car or motorcycle, I can just launch TomTom and have a world-class street navigation system. With TomTom, I can get maps for virtually anywhere I want to travel. I am really looking forward to using this device and will report back more about it later after I’ve had a chance to give it a good workout on all my vehicles. I wanted to put this entry together for a few weeks, but felt a little funny submitting it back then because it’s about a TV show called American Chopper that hasn’t yet aired. I got to see a new bike they designed and was there for the unveiling. This will be the topic of tomorrow night’s (March 29 episode as well as the following week’s episode) and I felt like it might be a bit of a spoiler to post it too early, but now that the “eve is upon us” as they say, I thought it would be OK to post a few pictures of the HP Bike. The bike is absolutely stunning, among the best I’ve ever seen, and it was such a thrill to be there for the unveiling and to see the Teutul’s up close and personal like that. It was quite an unexpected treat. I’ve been watching the show for a few years myself and I find it very entertaining, mostly because of the family dynamics of Paul Teutul and his sons. This was initially not intended to be the attraction of the show, but once you get hooked into the drama, it’s like you become a member of this family. You almost wish you worked there, and then at other times, you’re glad that you don’t.